Imprisoned on the other side of the universe without his mighty hammer, mighty Thor finds himself in a race against time to get back to Asgard to stop Ragnarok - the destruction of his home world and the end of Asgardian civilization - at the hands of an all-powerful new threat, the ruthless Hela. 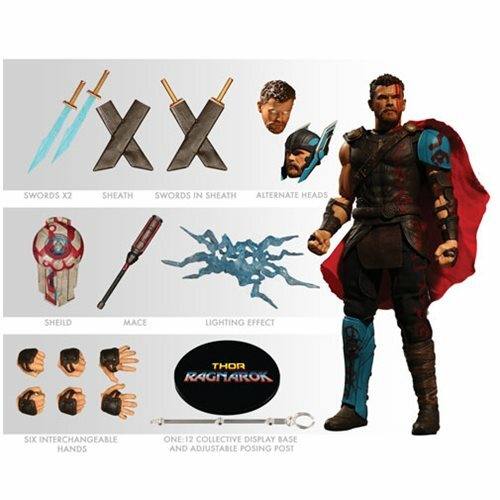 With over 30 points of articulation, the Thor: Ragnarok Thor One:12 Collective Action Figure captures both the character's unique physique and his richly detailed costume. In addition to swords, shield, and mace, Thor features interchangeable faces and hands and a helmet with film-accurate rotating wings. Because Thor is the God of Thunder, he also comes with a removable lightning effect to replicate the F/X from the blockbuster movie… and more!